On September 12, 2000 WPA members met for our September meeting. Here is a brief synopsis of what Mr. William Engel presented on this much collected stoneware. Old Sleepy Eye was a Native American Indian chief — Sleepy Eye is also the name of a town in southwestern Minnesota (located on US Highway 14). Old Chief Sleepy Eye was affectionately chosen as the mascot for a flour milling company in Sleepy Eye, Minnesota. The Sleepy Eye stoneware was designed and decorated with Old Chief Sleepy Eye’s likeness and used as a promotion for selling flour; the pieces of pottery were given away with 50lb. barrels of flour. However, the government intervened in the give-aways, perhaps because the rather heavy pottery pieces had a negative affect on the amount of flour that was contained in those 50lb. barrels. The stoneware pieces were later sold, printed with advertising, to grocery stores and such. Western Stoneware of Monmouth, Il originally produced the Sleepy Eye stoneware. Monmouth Pottery later bought the Western Stoneware plant, which at one time had the largest contract for pottery ever signed in the United States. Redwing pottery eventually surpassed this Sleepy Eye contract. The Sleepy Eye Stoneware pieces included butter-crocks and steins, which were made around 1890. William Engel described some of the pieces as “Flemishware” — some of these pieces were marked as such on the bottoms. The Flemish-styled pieces were white with blue heads of Chief Sleepy Eye. Some pieces also had blue borders or trim around rims. Certain pieces also had an Indian chief’s head done in relief on the handle. In addition to the blue and white pieces, designs included white with brown decoration. Some Sleepy Eye pieces were made by the Weir Pottery — these pieces are probably the most valuable today. The Weir pieces are marked “Weir” inside of a circle on the bottom. Mr. Engel discussed how to spot reproductions of Sleepy Eye pieces — many have a hole or indentation on the inside where the handle is attached, say for a stein. Sometimes the holes have been filled in, but a black light will reveal these “repaired” pieces. It was interesting to learn that Sleepy Eye collectors fancy stoneware and pottery from a variety of manufacturers, referring to it all as Sleepy Eye and Sleepy Eye shows and swapmeets contain a variety of pottery makes. Mr. Engel mentioned that there are two Brush-McCoy pieces that have Indian heads on the handles (and that these pots are included as Sleepy Eye pieces). Some believe that this was due to a Monmouth designer that also did work for Brush-McCoy. We were shown several pieces of stoneware or pottery with the “ugly Indian” design. These pieces featured a less attractive Indian and were made sometime in the 1930s. We also saw an Indian head pitcher, white in color with a blue glazed design and a maple leaf on the bottom. These pieces had the “sucked in” handle marks on the inside. Monmouth has been known to make pieces with maple leaves on them. 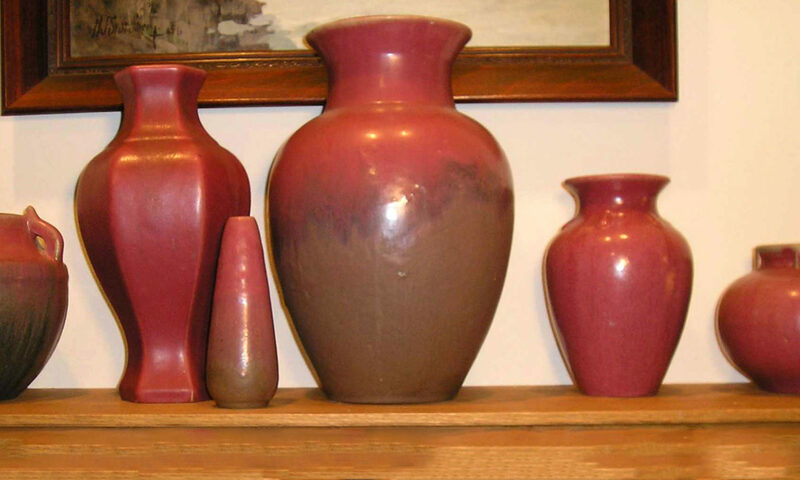 In addition, Whitehall pottery is known for unglazed bottoms, which these pieces had. Mr. Engel also showed sugar bowls — some white with blue and also burgundy pieces. Redwing did two mugs for Sleepy Eye. For these pieces, the Indian head was accompanied by a saying. Some of the examples of Sleepy Eye stoneware that Mr. Engel showed the club included a couple of mugs that featured Chief Redwing (who came before Sleepy Eye) — these mugs were signed by the artist. In addition, we saw a series of 9” vases with a dragonfly and cattails done in relief. This vase was done in approximately seven different glazes, including a black design on white, and an all black vase. These pieces were created by Monmouth, but once again, are included as Sleepy Eye stoneware. Many thanks to William Engel for his excellent presentation on Sleepy Eye Stoneware!